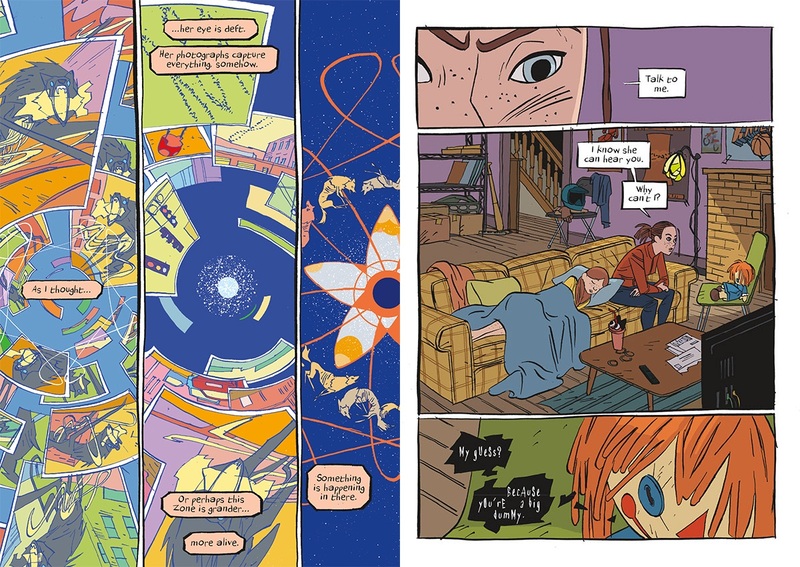 The opening graphic novel introduced photographer Addison Merritt who takes regular trips into what’s known as the Spill Zone, a prohibited area, in effect an entire city where an odd event occurred, changing the environment. 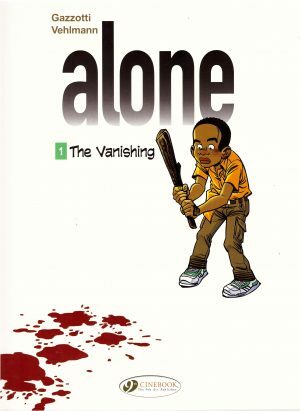 The only escapees were a group of school children including Addison’s young sister, who emerged with her doll possessed by something from the zone that only she can hear. Time has moved on. Addison made a final excursion to retrieve an item for a million dollars, although she’s unaware this is on behalf of the North Korean government, and from the start of this book the previously seen Jae, a North Korean with super powers plays a larger role. There’s also a zone in North Korea, and Jae has some experience manipulating what he’s become. 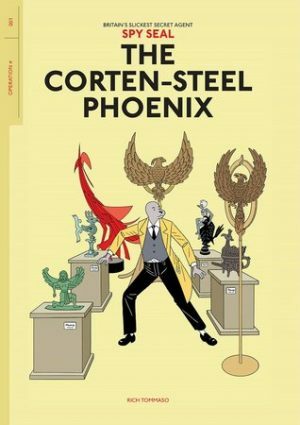 Even more so than in the first volume, Alex Puvilland amazes. 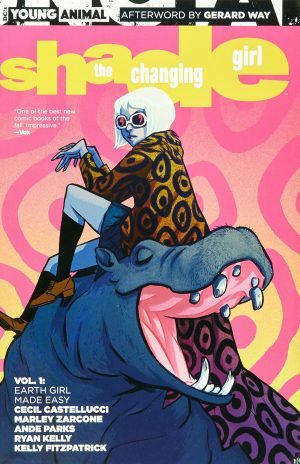 He’s a rare comic artist who embraces colour, the brighter the better, and coupled with abstractions and strange images he associates with the Spill Zone it results in a memorable visual experience. He’s also adept at the fundamentals, enabling the story to be followed and the cast to be easily distinguished. The needs of The Broken Vow require the straddling of a fine line between the surreal and the mundane, and Puvilland delivers superbly. Scott Westerfeld’s vast experience as an inventive author of children/young adult novels is again apparent. He knows how to intrigue, and we know from the first book that there’s pay-offs. 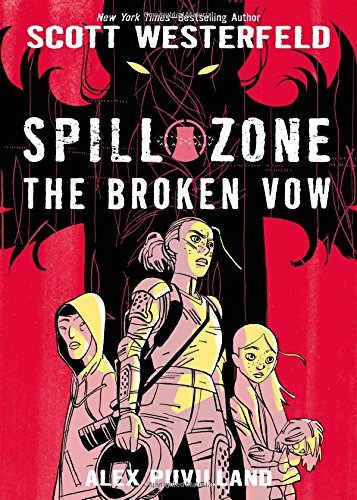 In Spill Zone the tension was generated by Addison’s illicit visits into the zone, and the possible dangers she encountered there, whereas The Broken Vow switches tack as Westerfeld involves the likely response in the real world. That’s not to say the zone itself is ignored, and toward the climax it features heavily, as this is also a more action oriented book than its predecessor. A nice aspect is that Westerfeld doesn’t oversell what’s in the Spill Zone. Some matters are made explicit, but most are left relatively vague for readers to piece together, except that kicks another door open with results that aren’t as pleasing. That’s because after a second thrill-packed and uncertain ride, in the final knockings Westerfeld’s sure touch slightly deserts him. There’s a solution to everyone’s problems, and it’s foreshadowed early, but it’s a solution that’s just too easy, and some specifics would have strengthened the finale. An enigmatic epilogue is more satisfying, suggesting that not everything is as clear cut as might have been assumed and leaving the door open for a continuation should we demand it. 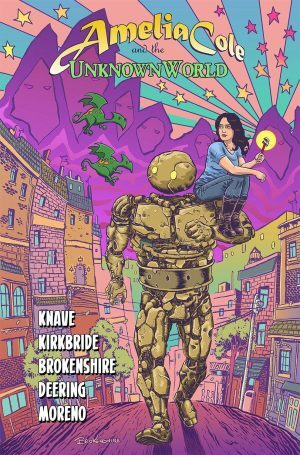 We should as there’s one hell of a lot of imagination on display from writer and artist, and that the ending is a little too easy doesn’t detract from the thrill of working towards it.